I brought it home and read it with rising enthusiasm. The idea that it might be possible to live and work among a group of fellow Yogananda disciples was astounding! I made a reservation for a ten-day stay at the Ananda Seclusion Retreat. Arriving at the retreat, I settled into my little tent and set out to explore the community. It wasn’t long before I realized that I had stumbled onto something special. Many aspects of the life at Ananda inspired me – not only the meditations, but the daily life of the residents. Ananda felt like home. I realized with increasing inner certainty that I would live here. But I wanted to be sure. So I resolved to dig deep into the community and learn what made it tick. For ten days I tramped the hills, knocking at the door of each home and workplace and chatting with the members and taking pictures. 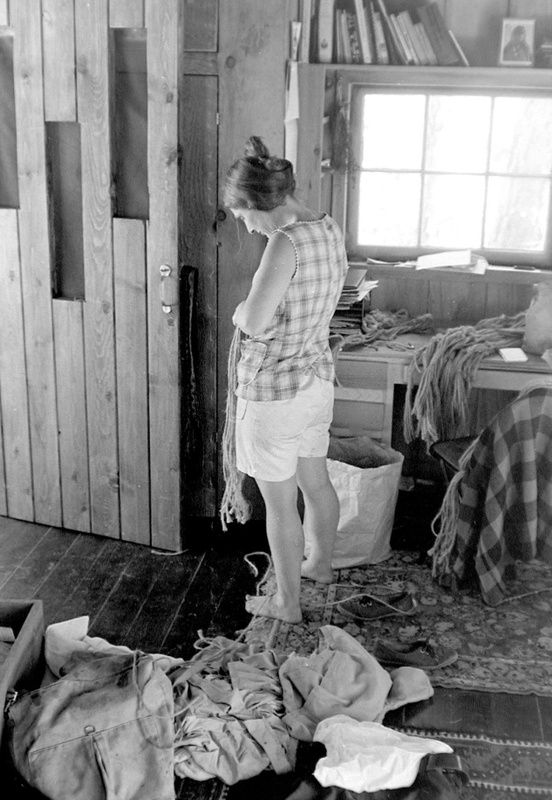 One of the few surviving photos from my first visit to Ananda, in 1974. (The other negatives were recycled by a mother mouse to build her nest.) The photo shows Sadhana Devi, now Nayaswami Sadhana Devi, tying macrame plant hangers – an early community business that employed quite a few stay-at-home mothers. Talking informally with housewives, carpenters, children, and schoolteachers, I sensed an underlying quality that united these people. It was a joy that I saw shining in their eyes, and an aura of happiness that I felt in their company. I began to believe that it would be worth any amount of effort to find that “something” for myself. I couldn’t know it, but it would be the only time he would ever praise my photos, or encourage me in photography. I was not, in fact, a visual person. I had taken up photography as part of my recovery from a difficult period of illness and depression. I borrowed my father’s 1930s Zeiss Ikon camera and spent hours walking, praying, and looking for things to photograph that would expand my heart. The controls on the camera had to be set manually, and most of my pictures were poorly exposed. But whenever I had a sense of God’s presence while snapping a photo, the exposure would be perfect. Those “God-tuned” pictures often seemed to take themselves. I would be walking along praying, and a moment later I would have taken a picture, without knowing quite how it happened. Those were the only pictures that inspired me. Photography was a healing practice. It was an expression of a quiet inner communion. God sometimes gave me pictures that were unremarkable in their content but luminous with joy, perhaps to remind me that He is present even in ordinary things. Occasionally I felt Him laughing through my photos, as when I took a photograph of a massive and quite ugly power plant in Moss Beach, California. I thought, “Why in the world am I taking this picture?” But it turned out to be sweet in a quirky, postcard kind of way, and my girlfriend asked me for a print. In the early 1970s, as I’ve mentioned, I was a staff photographer for five sports magazines. One day, on assignment at a major international swim meet with Olympic-caliber athletes from all over the world, I decided to put my beliefs about spiritual photography to practice. With hundreds of athletes and officials milling about, I visualized a circle 12 feet in diameter and vowed to photograph the entire meet from inside that small area. On the one hand, I would have that severe physical limitation. On the other, I would have my prayers. I took about two hundred pictures over the next three hours. All but seven were published in magazines or advertisements. Not bad, considering that most professional photographers are happy with a much lower average. 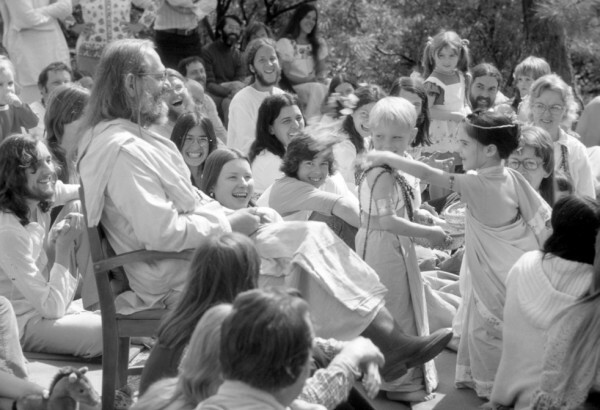 A birthday party for Swami in a lovely meadow near the Expanding Light, 1976. Whenever I took photos of Swami Kriyananda, I noticed that I could never take a decent photo of him unless, in some subtle way, he “allowed” it. Soon after I came to the Village, I bought a telephoto lens. I looked forward to taking close-ups of Swamiji’s face during his lectures. I brought the lens to a class in the Temple of Leaves at the Seclusion Retreat. I raised the camera and peered through the lens in anticipation. Swamiji’s face filled the frame as I had hoped, but he looked extremely unphotogenic, even displeased. And now, gosh, he was turning away as if to hide his face. I realized that my attitude was wrong, that in trying to “grab” close-ups of his face I was, in fact, being just plain rude. When I arrived at the Village, I was offered a job at Ananda Publications (later renamed Crystal Clarity Publishers). One of the nuns kept prodding me to take portraits of Swami Kriyananda that we could use in our advertising. Impatient with her nagging, one day I grabbed the camera and tramped over the hill to Swami’s, set on getting the noxious chore out of the way. When I arrived, Swamiji and Asha were chatting in the living room of his dome. I explained why I had come, and asked Swamiji if he could step onto the porch where the light was better. I was feeling irritated and impatient, and when I pointed the camera at Swami, I saw – not Swami Kriyananda – but Rambhakta! Swami was looking red-nosed and bug-eyed and completely out-of-tune – just like me! I was dumbfounded. At one point, Swamiji glanced, deadpan, at Asha. I don’t know how she kept from bursting into laughter. It was enough – I didn’t bother showing the prints to anyone else. The negatives are in the Ananda archives. God help future generations who imagine that Swamiji looked like that! 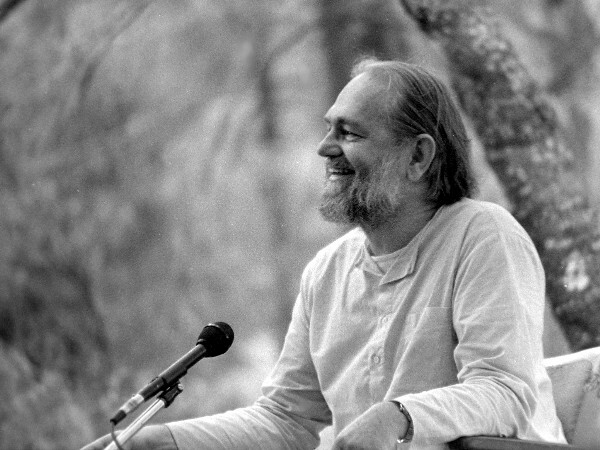 Here’s an early photo of Swamiji giving a talk during Spiritual Renewal Week in the Temple of Leaves, Ananda Seclusion Retreat, probably 1975. If Swamiji was writing a book, he would often invite the members to his home to listen to him read several chapters. Then he would invite our comments and suggestions. I raised my camera to take a picture, and Swamiji subtly became several degrees froggier, as if to say, “Here, Rambhakta, let me help.” Needless to say, none of those photos ever made it into Ananda’s brochures! A friend at Ananda Village asked me to take pictures at her wedding. When I arrived, I was in an uninspired mood. I sensed that the marriage wouldn’t last, and it dampened my spirits. The couple seated themselves before Swamiji. But before he started the ceremony, he paused and glanced sternly in my direction. I realized that the paramount thing, as ever, was kindness. I prayed sincerely to be an instrument for Divine Mother’s blessings on the couple. The photos came out well. After the ceremony, I continued to take photos, and at one point I turned just in time to take a photo of the bride in conversation with Seva. Seva was gazing into her eyes lovingly. The photo “took itself.” It came out beautifully and was used in a brochure for one of our programs, on women and spirituality. At another wedding, my problem was the opposite – I tried too hard. A woman asked if I would photograph her wedding. I was surprised, because she and I had never gotten along – in truth, she had made it known that she couldn’t stand me. She said, “Well, I asked Jyotish and Govinda, but neither of them are available, so could you do it?” Despite her rudeness, I accepted, feeling that someone ought to take pictures at her blasted wedding. She gave me the details – Swamiji would conduct the ceremony at the Crystal Hermitage chapel. Another photo that “took itself.” I suspect that Divine Mother wanted to record the beautiful friendship between these devotees, both of whom served us as wonderful examples of discipleship. I vowed to do my best to turn the event into an inner victory. I spent the intervening days praying fiercely for the bride, insisting that God shower her with His grace and bless her marriage. It was an all-out battle of the heart, which I was determined to win. There would be no compromise. I would not succumb to my feelings of resentment toward her. I would destroy them with the power of prayer. The wedding was lovely. The Crystal Hermitage chapel is charming. It is modeled after the Porziuncola, the tiny church near Assisi that Saint Francis built with his own hands. The chapel at Crystal Hermitage has a more modern, open feeling, with large windows behind the altar through which the sunlight streamed, creating a lovely backdrop for Swamiji in his white robes and the bride in her beautiful gown. All was peace – except for Rambhakta, who was praying like a speeding diesel truck, blasting prayers for the bride and groom. I would give my all – I would not let my attention wander for a fraction of a second, and I would hold myself in readiness for God to use me as His instrument. After a while, I felt Swamiji extending his thoughts to me, offering an aura of peace, as if to say, “For goodness’ sake, Rambhakta – relax!” But I refused to drop my guard. Swami was always one-hundred percent focused on the person he was talking with. I never saw him, through the lens or at any other time, when he wasn’t completely self-offered to God. The wedding photos were among the best I had ever taken. They became so well-known among the women in the community that I was asked to photograph the next thirteen or fourteen weddings. In time, I became so fed-up with taking pictures of “hitchings” that I would deliberately not answer the phone whenever a wedding was impending. Fortunately, several other photographers moved to Ananda and were happy to step in. 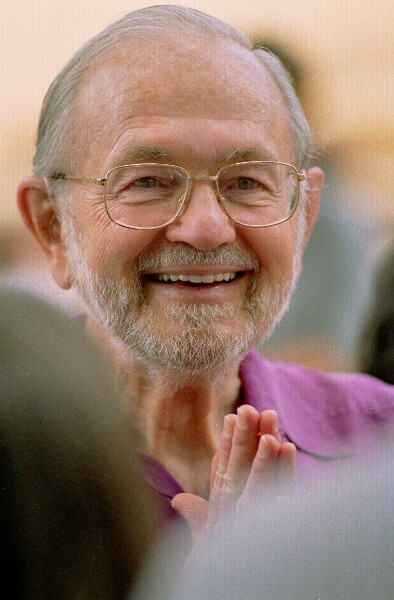 Many people have photographed Swamiji. Their pictures always seem to reflect something of their own nature. Thus, a photo that Jyotish took of Swamiji in India, and that often graced Ananda’s literature, reflects the flavor of Jyotish’s attunement. I doubt that another photographer could have taken it. Similarly, Govinda’s photos of Swami reflected his simple good nature. Norman Seeff, a Hollywood photographer of rock musicians, became interested in Ananda for a time, and at one point he visited Ananda Village for a portrait session with Swamiji. “A saint who’s sad is a sad saint, indeed.” – St. John of the Cross. On the day of Norman’s visit, I trooped over to Swamiji’s house to watch the professional in action. He had brought his traveling studio, which included a heavy backdrop, professional lights, a crew of three or four assistants, and a fan to give Swamiji that West Coast “windblown” look. The photos were technically superb. They portrayed Swamiji in a handsome, cordial light. 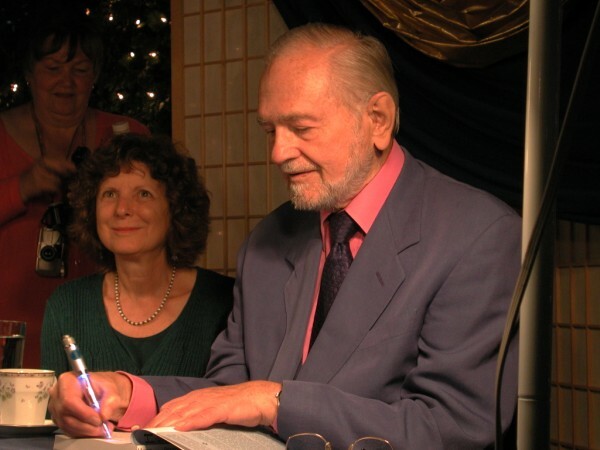 We used one of them for years in our brochures, and were grateful for Norman’s help. But the photos did show Swamiji looking subtly a bit more “on stage” than other pictures, even though his eyes and general demeanor were as calm and inwardly joyful as ever. During the session with Norman Seeff, I felt completely out of tune. It was as if the world were spinning too fast and I couldn’t stand up without falling. It was awful. It wasn’t the first time that it had happened. It was very common for people to feel inwardly “worked on” while they were around Swamiji. I remember comparing notes with two other Ananda members after a meeting at Swamiji’s where I had felt my “innards” being churned. Both reported that the meeting had been difficult for them, and that they had felt their worst qualities coming up to be exposed to the light, as I had. 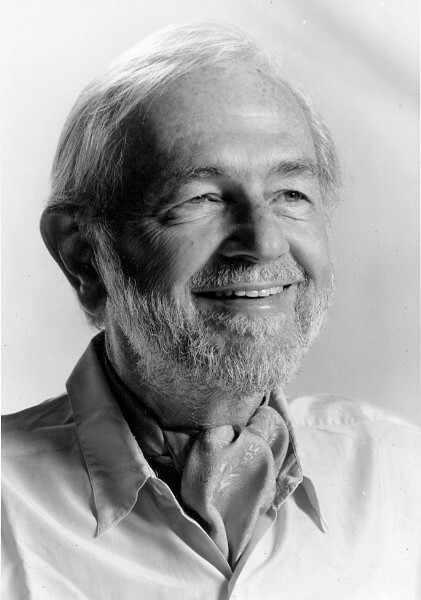 The humblest man I ever knew, and the kindest. There was a powerful aura of egolessness around Swamiji that was very destructive of our illusions. Egotism and long-ingrained feelings of self-importance were jostled loose in his presence, often painfully, without his ever saying a word. I was perfectly convinced that Swami was aware of our tests, but I knew that he would never lighten them, from sympathy or favoritism. They were necessary for our growth. But he would sometimes let us know that he was aware of what we were going through, and that he was on our side. I remember a meeting where my ego was silently but severely and uncompromisingly pummeled. I made my way to the door reeling inwardly, and as I mumbled a farewell to Swamiji, he seemed to pull back a bit, looking somewhat removed, his face warm but impassive, as if to say “I can’t help you to pass this test, Rambhakta – but I’m rooting for you!” At the last moment he reached out and patted me on the head, still looking kindly but restrained. At the photo session with Norman Seeff, I felt absolutely reduced to dust, utterly worthless and discombobulated. After the session, when the photographic assistants were breaking down their equipment, I stood next to Swami’s chair, churning inwardly and feeling quite numb. One of the assistants stood in the balcony directly above us. He began lowering a very heavy photographic backdrop – it must have weighed 75 pounds. As it came down, it was aimed at Swami’s head, and I reached out a hand to guide it safely to the floor behind his chair. The assistant said, “No, no. No need.” But I was concerned, and at the last moment the backdrop slipped out of the man’s hands and fell. My hand shot out instantly and caught it, completely without conscious thought. It would certainly have hit Swamiji, seriously injuring him. I can’t help but think that it was Swamiji’s way of reassuring me that there was some way that I could be useful, and that it would be good to cultivate an attitude of service. Things had a way of working out around Swamiji. I remember working at “Pubble” on a hot midsummer afternoon, when Swamiji dropped by. He asked me to take a photo of the cover of his latest book. The entire Pubble staff, naturally, trouped outdoors to be with Swamiji and to watch. I placed the book cover on a plain white background and began taking pictures. Swamiji said that he would like to try a different background – a light-pink would be good. I wandered into the print shop, wondering where in the dickens I would find pink paper – and there it was, in plain view, atop a foot-high stack of colored paper. Swamiji said the paper was perfect, and I resumed taking pictures. But then it occurred to me that since I was feeling hot and mentally fried, perhaps Swamiji could do a better job, as he would be more detached from the outward circumstances, and more in tune with God. “Swamiji,” I said, “Would you like to take some pictures?” He replied instantly, “Of course!” and he fairly leaped up from the couch. As he knelt on the ground and bent over the book cover, I saw that he was panting from the heat. His hands were quivering and drops of sweat were running down his face. His complete willingness and humility touched me deeply. Whenever I viewed Swamiji through the lens, one of the things that stood out about him was a wonderful quality of “sameness.” It’s hard to describe, but the photos that I took (with the notable exceptions of my “bullfrog” and “red-nose” masterpieces) looked subtly the same, as if he were identified more with the changeless Self than with his personality. “I am always the same,” said Sri Anandamoy Ma. 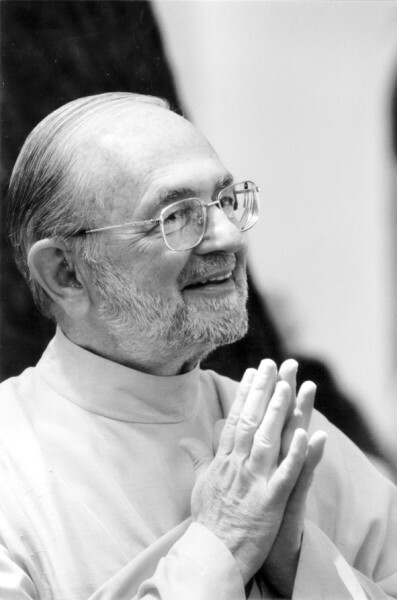 I observed this quality in Swami Kriyananda throughout the thirty-eight years that I photographed him. I noticed that “sameness” also in the photos that I took while he interacted with others. After a class at Spiritual Renewal Week, I followed Swamiji around and took pictures of him through a telephoto lens while he mingled with the crowd, stopping to talk with one person or small group before moving on to another. I stood on slightly higher ground, where I had an unobstructed view as I followed him with the camera. As I watched him through the lens, it struck me that his attention was one hundred percent with the person with whom he was talking. I realized that he was offering himself completely to be an instrument for the help that God might want to give that person. In all the years that I photographed him, I never saw him treat people any other way. It was interesting to watch him at public events when he wasn’t interacting with others. 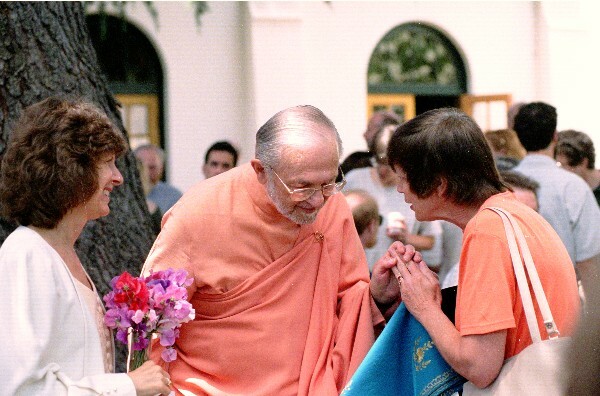 One of our Palo Alto ministers told me how she was talking with Swamiji, when she inwardly began to hear the mantra “Om Guru.” Later, someone told her that it was the mantra that Swamiji habitually repeated when his attention wasn’t otherwise engaged. I noticed that whenever Swamiji had finished talking with people in his usual warmly engaging way, and when the conversation ended, his expression would become grave and inward. I sensed that he was offering himself to Guru and God. At one point, someone on the staff of Ananda Publications scheduled a photo session with Swamiji. It would take place the following Monday morning. But it wasn’t. When Monday came, I was a limp biscuit. I lugged the camera and lighting equipment to Swamiji’s house, set up the lights, and after taking a few uninspired photos, hooked up Govinda’s camera to the lights and collapsed on the sofa with a sigh. As I watched Govinda, I recalled a portrait technique that I had read about in a book, but had never tried. It was used to take portraits of business executives, and I didn’t know if it would be appropriate for Swami. But it was the only thing that evoked any enthusiasm in my over-cooked brain. I rearranged the lights and took the picture. Swamiji seemed to perk up for that photo, as if he were reflecting my last-gasp burst of energy. Of all the shots I took that day, it was the only one that was ever used in our brochures. God had, as He so often does, made the most of the meager resources at hand. After taking this photo, I collapsed on the couch, exhausted from my ill-advised marathon three days before. Unlike most folks when they have their photos taken, Swamiji was completely detached about his appearance. He would dress appropriately when he had a formal portrait taken. But I once took a photo of him – with considerable trepidation while he edited a manuscript, wearing a t-shirt that had a sprightly number of holes in it. Being the community’s only photographer was an odd role for me to have, because I was shy around people. And I was particularly nervous when taking photos of Swamiji. One afternoon, I came out of Master’s Market just as Swamiji’s car pulled up. He emerged, accompanied by a group of devotees who were escorting him to the airport in Sacramento. 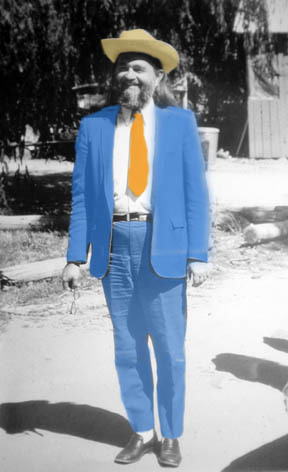 He wore an outrageous bright blue suit, a bright orange tie, and pants that were too short. Did I REALLY want to take a photo of him in that get-up? I asked if I could take his photo. Someone handed him the hat, and there you have it. I had black-and-white film in the camera, so I later played with Photoshop and recreated the approximate effect. (Asha helped me adjust the color of the sombrero.) Enjoy! And, yes, go ahead and smile. P.S. 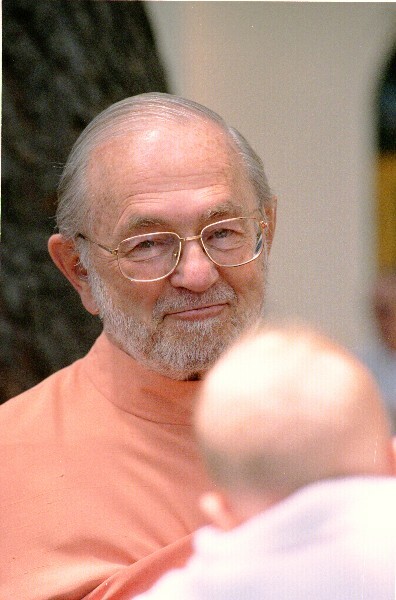 Swamiji said that Ananda’s colors are blue, white, and gold. They are the colors of the Nayaswami Order: blue for nayaswamis, gold (yellow) for brahmacharis, and white for tyagis. Asha tells me that Swamiji loved the pure blue color of the suit, which he had bought from a tailor in Kashmir. 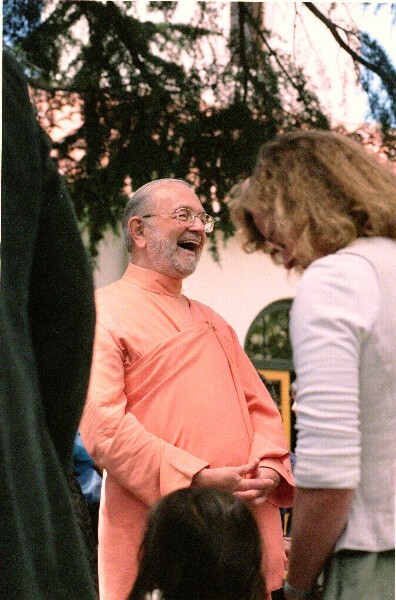 Years later, I took photos of Swamiji after a talk that he gave at the Ananda Sangha temple in Palo Alto. He sat at a table and greeted a long line of guests. He was seventy-six at the time, in poor health, having experienced recent very worrisome fits of coughing, as well as fever, heart arrhythmias, and difficulty walking. I took pictures for a while, then I stepped back and silently watched as he signed books and chatted cordially with each person. I suddenly became aware of an immense river of bliss that was pouring through him and bathing the shores of those people’s souls. It was no gentle benediction – it was a mighty torrent of joy, a roaring Mississippi of ecstasy. It was so wonderful that I found myself involuntarily smiling and hastening to add my tiny tithe of prayers to its mighty flow. I looked at Swamiji’s face. He was completely self-possessed, withdrawn from the realm of likes and dislikes, merged in the flow of God’s love. Swamiji signs books after his talk in Palo Alto, while emitting immense waves of divine bliss. With Nayaswami Asha. As I mentioned earlier, photography has never been my main dharma, my destined spiritual duty. I became the resident photographer at Ananda Village more or less by default, because I had basic camera skills and plenty of willingness, and the previous “official” photographer had recently left the community. 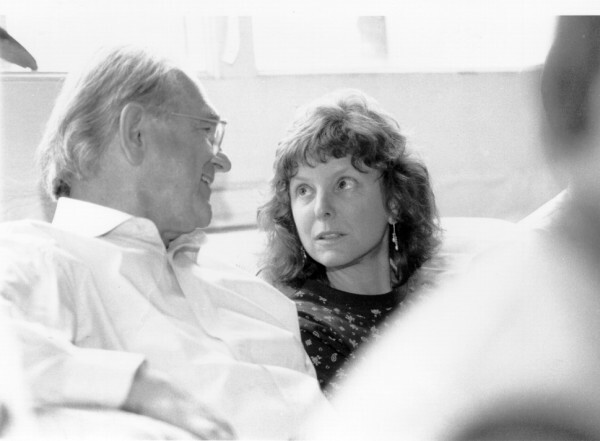 I believed deeply in the need to record life at Ananda, knowing that the early years of this humble village would be an important event in the spiritual evolution of the planet. Several other photographers eventually joined Ananda, and unlike me, they had a true dharma to do photography. Yet, peering at Swamiji through the lens over the years was a wonderful avocation. It was very helpful for me to observe his complete self-offering to God and Guru. For that inspiration, I am very grateful. Wow! Bless you for sharing. Your story & photographs bring love & joy to all of us, Rambahkta. Tears filled my eyes many times. Thank you! What a beautiful story and wonderful photos. Thanks so much for sharing your personal experience with us. I really enjoyed it. Thank you so much for sharing your sweet and humble perception with us. It is so inspiring and touching. Thank you for your honesty and bluntness. I sooo appreciate we get to see some pictures from early Ananda stages.